As the storied magazine company returns to its inky origins, the future looks bright for digital journalism as a product, but dim for large-scale digital journalism as a business. Time Inc., the mother of newsmagazines, was born in 1922. She survived wars and recessions, grew up to be fabulously rich by mid-century, married the media giant Warner Communications, entered the golden years as one of the largest media companies in the world, suffered a mid-life crisis at the hands of AOL, and watched Warner Music Group and Time Warner Cable (both adopted offspring) graduate into independence. But today the circle of life closes its long arc, as Time Inc. is starting over again as a pure publishing company, anxiously asking the same question it successfully answered 90 years ago: Are magazines the future? The minute-to-minute gyrations of Time Inc.'s new public stock—debuting under the symbol: TIME—made today's noise. But I think we're all better off listening to the background music. With subscriptions hurting, newsstand sales falling, and advertising fleeing print, Time's publishing revenue has fallen in 22 of the last 24 quarters. It's clear what getting rid of Time Inc. will do for Time Warner. The publishing arm might have the name on the building, but the "Warner" divisions—cable channels, film, and TV entertainment—now account for more than 95 percent of the corporation's revenue and profit. Shedding the dead skin of print frees them from the conglomerate curse, where investors discount the value of complex corporations that comprise many different businesses with varying health. Time Inc.'s path is more uncertain. Print, as a category, is in structural decline, a point this famous Mary Meeker graph clearly makes. 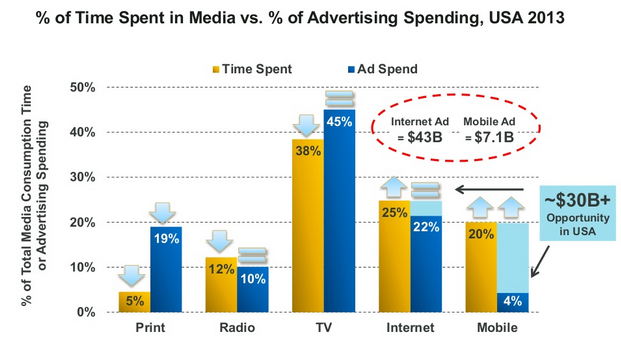 Both time-spent and ad-spend in print are falling steadily. For more data, I consulted MoffettNathanson, the great research firm that details $90 billion in annual ad spending. 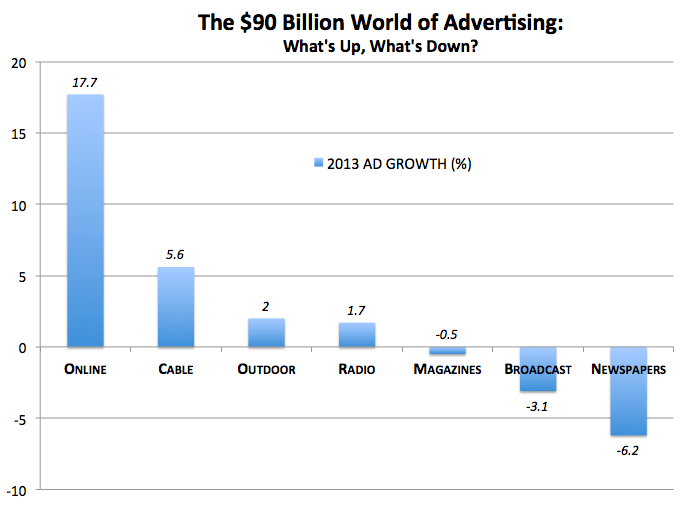 Here are the year-over-year ad figures across digital, TV, radio, outdoor, and print. Magazines aren't doing as poorly as newspapers. But cable TV and online ads—which together account for more than half of ad spending in the U.S.—account for practically all of the growth in the U.S. advertising business. You might look at that picture and say: Okay, obviously digital is the place to be, so Time should shift its resources toward the web. The trouble is that it's not so simple as taking a magazine staff and asking them to trade in their lush and lavish print tendencies for rapid-fire Internet instincts. First, since you need fewer people to publish a web story than to produce a printed page, that transition means laying off a lot of people (the company just announced 25 percent cuts). Second, digital banners and native units are much cheaper than full-page ads, so you can't afford the same staff, anyway. Time Inc. is staffed by plenty of digital natives who understand this stuff intuitively. The trouble is that shifting a print-centric model to digital is rough, no matter how smart your leadership is. Finally, the shift to digital isn't benefiting large media corporations so much as it's enriching search and social media companies that can scale audiences and their data to create targeted advertising that a media company could only dream of replicating. 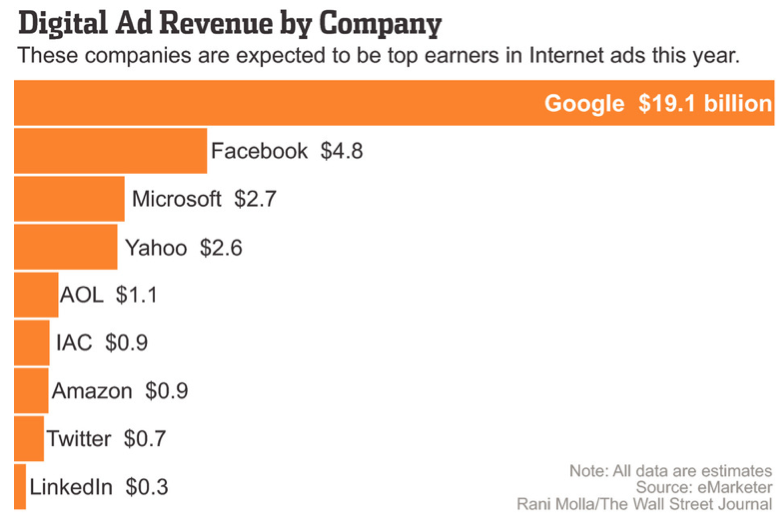 Google and Facebook control 50 percent (and growing) of the domestic ad market. After you add Microsoft, LinkedIn, Twitter, and Amazon, you've accounted 70 percent of digital advertising. Some of the largest digital media companies, like the commercially hapless Yahoo and AOL properties, are left fighting over scraps of branding banners and squares. Even lean operations like Gawker Media are victims of digital journalism's lean margins. It's not a coincidence that the most successful big digital media property, BuzzFeed, isn't really in the old-fashioned adjacent advertising business at all. It's a website where original stories live next to "promoted" ads engineered by an in-house laboratory for building advertising that will go viral. That's not like Time Inc going into digital journalism. It's more like Mad Men going into digital journalism. Even as the Web attracts a larger share of our attention, it could struggle to attract a similar share of advertising, because our digital attention (especially on mobile) just isn't similar to our attention with other media. We spend hours with TV. We spend many minutes with a favorite magazines or print newspaper. Meanwhile, we look at our phones 150 times a day for a few seconds. A few seconds is a good time to answer a Google search with an ad that answers one pressing question. (No wonder Google has ~50% share of mobile ad spend.) But brand advertising—which typically supports general-interest journalism—isn't about answering questions. It's about leaving impressions. How do you make an impression in five seconds? As attention continues to shift to small digital screens, you should expect more media companies to seek revenue outside the traditional adjacent-advertising model: building ads like BuzzFeed, organizing limited events like ReCode, or charging for truly unique journalistic services, like the Wall Street Journal. Maybe Time Inc. will figure all this out. Maybe someone like Vox Media will figure out how to build the Time Inc. of the Internet. I hope so. (The Glam-ification of the web strikes me as a quasi-apocalyptic outcome.) But I don't see a thriving future for the largest digital journalism enterprises as businesses, even though the web offers sensational opportunities for digital journalism as a product. My bet is that small, niche, and premium digital journalism survives with high CPMs and light costs, while big, broad, and everything-for-everyone journalism struggles with low CPMs and heavy ambitions.